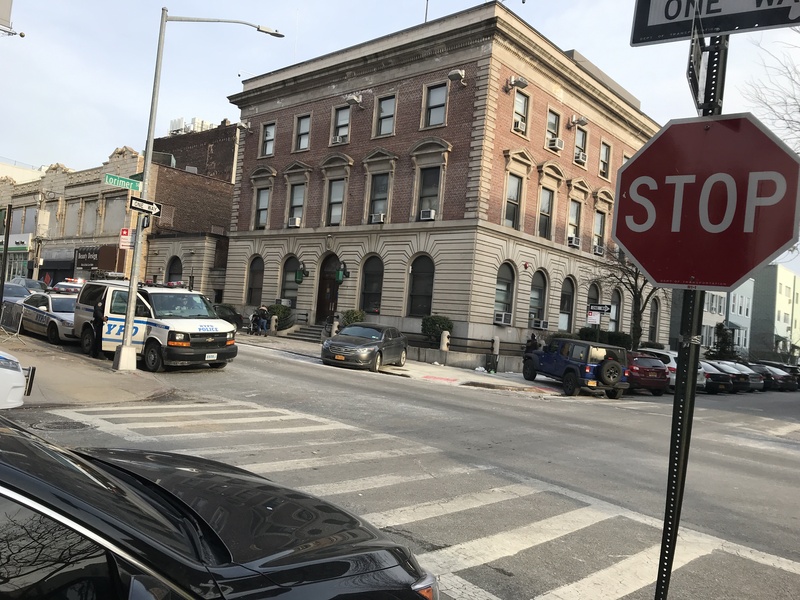 Latest report follows Streetsblog's earlier investigation of the 76th Precinct in Carroll Gardens, whose car-commuting cops were also repeat offenders. To protect and serve — or unnerve? The majority of cops who drive to work at two North Brooklyn stationhouses — and will likely drive in greater numbers if Mayor de Blasio makes good on his recent promise to give them more parking — have driven recklessly, and one-third of the officers have done it more than once, a Streetsblog investigation reveals. Streetsblog observed 76 personal cars parked in “NYPD-only” spaces outside North Brooklyn’s 90th and 94th precinct stationhouses on Friday. Of those 76 vehicles, 60 cars — or 79 percent — had a least one parking or moving violation on their records. Taken together, these reports suggest that de Blasio is making a potentially deadly mistake in his plans to build or lease additional parking spaces for police officers — a proposal he unveiled late last month as one solution to the crisis of illegal parking by police officers and other city workers, a practice known as placard abuse. The city has created more than 120,000 legal parking spaces exclusively set aside for public employees who wish to drive to their city jobs — teachers, firefighters, cops and many other agency workers are all the beneficiary of this subsidized perk. Studies have shown that city employees are less likely to commute by car to their jobs — but that equation changes when the workers are given parking, making them more likely to drive. The mayor said that he intended to provide more parking for cops as a tribute to their hard work and service to the city. We can designate more and more parking spaces in the community for our uniformed officers and … there will be enough parking for them. …. We can also — and we will — purchase parking lots, we will lease parking lots, parking garages, whatever it takes so that our firefighters, our police officers, our EMT’s actually have a place that they know they can park so they don’t need to be someplace that takes away parking from neighborhood residents or the customers of small business. Until we give them that good option, of course, many officers will feel they have no choice. … This is a very worthy investment – it’s fair to our employees but also fair to our neighborhoods. … Our uniformed officers do something very, very special and very powerful for this city, and they deserve special consideration. The mayor hasn’t put a price tag on his proposal. A City Hall spokesman said the city is currently surveying all of the NYPD and FDNY parking needs so that the de Blasio administration can then evaluate how to move ahead to create more parking for cops, despite documentation that many violate basic driving rules. He said he was motivated because cops are heroes — and because they apparently cannot afford to live in New York City, despite a base salary of $85,292 after five years on the force, an income that is roughly $35,000 above the citywide median income. Fifty-one percent of NYPD officers live outside of the five boroughs. 21 cop cars — 78 percent — had at least one fine. 19 cars — 70 percent — had at least one red light or a speeding. 10 cars — 37 percent — had multiple red light or speeding tickets. One cop’s car had 24 total tickets dating back to 2014, with six speeding tickets. #NY_FPN4897 has been queried 1 time. One car had 23 total tickets dating back to 2013, including eight speeding tickets and two tickets for blocking a fire hydrant. #NY_EXZ6750 has been queried 1 time. And one car had 45 tickets total since 2013, including four red light tickets, two speeding tickets and three tickets for blocking a hydrant. #NY_BZJ5027 has been queried 1 time. 39 police officers’ private cars — or roughly 80 percent — had been slapped with at least one ticket. 27 cars — or 55 percent — had at least one serious violation (a red light ticket or a speeding ticket). 15 cars — or 30 percent — had multiple red light or speeding tickets. One cop’s car had 20 tickets total since just 2017, including one red light ticket and nine speeding tickets. #NY_HPU4630 has been queried 1 time. One car had four tickets since 2015 — three of them for running red lights. #NY_MOVNWHPS has been queried 1 time. One car had 25 total tickets dating back to 2013, including six red light tickets and nine speeding tickets. #NY_EUS6369 has been queried 1 time. One car had 14 total tickets since 2013, including four red light tickets and two speeding infractions. #NY_GHN1298 has been queried 1 time. One car had 18 total tickets since 2013, including seven for speeding, four for running a red light and one for blocking a fire hydrant. #NY_BRN2974 has been queried 1 time. One car had 11 total tickets, including five for speeding and one each for running a red light and blocking a fire hydrant. #NY_HFF7561 has been queried 1 time. City Hall declined to comment for this story. Story was updated to make it clear that camera summonses are issued to cars, regardless of who might have been driving at the time of the alleged infraction. Someone should also tally how many bikers are running lights. If you’re gonna talk about “dramatically increasing the danger to neighborhoods” then you should also be out here campaigning for safe biking practices as well. How many times do you call out the significant percentage of a class of road users (bikes) who run multiple red lights on EVERY trip? YES, A bike won’t kill you, but I’d rather not be hit by ANY vehicles today. You all can start the flame war, or you can face the facts that bicycling has a serious image problem amongst the percentage of people who DON’T bike. Every time one of us runs a light to keep momentum it reflects poorly on ALL of us. Congrats on this textbook example of whataboutism. Well, it wouldn’t be Streetsblog if there wasn’t a “What About the Dangers of Drivers” article every day so…. Jay walkers too! They’re going around almost killing people. Bikes kill an average of zero people in this city on an annual basis. They don’t pollute, they barely take up any road space. They don’t stop emergency vehicles from getting through intersections. If cyclists were killing 30,000 people a year in the US and causing 100’s of 1000’s of premature deaths as a direct result of the pollution they spew, then it would be a prudent use of our finite law enforcement resources to crack down on them. Unfortunately for you, they’re pretty much innocuous, kill nobody and represent a future of urban mobility which doesn’t involve selfish slobs yelling in gridlock traffic before mowing down mothers with strollers in crosswalks. Right off the bat, we have the objective basis for moral high ground. We don’t need to start a flame war. We just need to present the facts calmly and rationally, something which the anti-cyclist lobby seems unwilling or unable to do. The “image problem” that we have is, essentially, YOUR problem, because it’s the result of YOUR ignorance and YOUR prejudice. How many defaced or otherwise non-readable plates did you find, Streetsblog? “Safe biking practices” is not necessarily the same thing as “legal biking practices.” Just for starters. But by all means, let’s apply the same standard to scofflaw cop parkers that we do to cyclists. Since we commonly cite cyclist scofflaw behavior as a reason not to add protected bike lanes to streets, we shouldn’t add parking for cops until they can demonstrate respect for our parking laws. Since every discussion about a dead cyclist invites commentary about “safe cycling,” we should mention, in every story about a dead cop, that cops often don’t follow the law and are probably to blame for their own deaths. I would expect that any blog dedicated to transportation issues would need to be highly focused on the problems posed by drivers and transportation networks designed to serve primarily their interests. In the broader context, the problem of scofflaw cycling merits hardly a blip. and this is almost certainly a vast under-counting of the danger, given the rampant culture of “Professional courtesy”. A flash of a badge and speed ticket magically disappears. Most infractions undercount dangerous driving, since cops aren’t everywhere. What percent of the actual infractions do these tickets to cops represent? You should have signed it as “Avid Cyclist” so that we know that you’re an expert. Drivers killed almost 1,000 people in the last 4 years. In the last 12 years, drivers killed more people than were killed in 9/11. Do you write to Car and Driver magazine asking why they don’t review more bicycles? He really believes that the only just usage for public space is cars. If De Blasio believes that more cops keeping an eye on our city makes it safer, then he should want all those officers traveling to work by bus, subway, walking, scootering or bicycling. It would add countless hours of police presence to the city, albeit off-duty, without any impact on the city budget. And who knows how many moving violation tickets these cops got out of by flashing their badge when pulled over. The clean looking cars with dark tinted front windshields, thick license plate covers and an overall blacked out/murdered out aesthetic, those are the typical cop personal vehicle. It’s usually a Jeep of some sort, badge removed with one small black and white American flag or skull type sticker on the back. Firefighters definitely drive Jeeps too, but less tinted, more raggedy and with big FDNY stickers on it. “Keeping momentum” isn’t the only reason, or the primary reason, why cyclists run red lights. In general it’s safer to do so, both for the cyclist and everyone else. Most cyclists who pass red lights yield to pedestrian and motor cross traffic, if for no other reason than self-preservation. The problem is the law hasn’t caught up to reality. Yielding at red lights should be legal for both cyclists and pedestrians. i’m an AVID cyclist and stroller pushing parent who also happens to drive a modified uparmored hummer with a triple gun rack, roll bars, bull bars, spiked hubcaps, no plates front and back, THREE placard vests, and the ability to roll coal at the push of a button. which of these things worries me for real? it’s strollers. strollers, pushed by holier-than-thou moms and dads and nannies, always edging off the curb, always jaywalking when no cars are around. I’ve seen a nanny (i’m not going to say where from because i’m not a racist #alllivesmatterbutmostlywhitepeople) just blatantly come within 10 feet of an elderly woman on the street MORE THAN ONCE. until we get the scourge of strollers under control, we should leave coal rolling murder vehicles alone. Cops can’t afford to live in the city? LOL the city is building tons of affordable housing with income requirements that cops easily meet. But they don’t want to live here and they most definitely don’t want to take mass transit. And how does this square with the Green New Deal? Do certain Democrats get to opt out? They don’t want to live in the city because they opt to live in what Ron Kuby so accurately called Whitelandia, rather than in the City amongst the people whom they hold in contempt and whom they openly refer to as animals. The firehouse near me has it’s own parking lot. They park on the sidewalk next to it even when it’s half empty. If you give one of these placard abusing trough feeders more parking lots, it won’t make it any less likely that they’ll park illegally. If it’s so much as 0.01% more convenient to leave their SUV on the sidewalk, that’s where they’ll leave it. De Blasio will never do anything to change this problem until he tackles the issue of the NYPD’s institutional corruption and their unwillingness to police each other. We need so many cameras! Seven more precincts — and 31 percent of the police officers' personal vehicles had been slapped with multiple moving violations. Streetsblog's ongoing investigation uncovers even more cops with horrendous personal driving records. On Day 4 of Streetsblog's investigation into rogue police officers, we found a real sociopath. Day 3 of Streetsblog's investigation reveals scores more police officers who endanger neighborhood residents with repeated moving violations. Someone assigned to the 78th Precinct in Park Slope has been slapped with 75 tickets on his personal vehicle — including 53 speeding tickets and five red-light tickets — since March, 2017. If cops supposed to protect us, why do we need to be protected from them?